I was pleased to attend a May 1 rally in the Capitol Rotunda to recognize and honor the Boy Scouts of America. 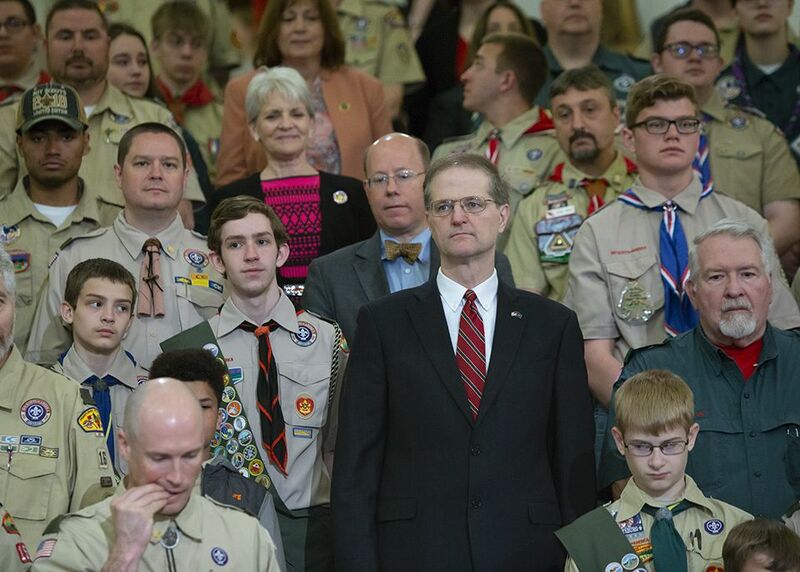 Hundreds of scouts and advisors attended the first annual Boy Scout Day at the Capitol to raise awareness of their organization and to provide the Governor and General Assembly with a report of the state of scouting in the Commonwealth. The Pennsylvania Department of Education is now accepting applications for the 2018-19 Safe Schools Targeted Grant program. The application period ends on July 31. Public and non-public schools, as well as police agencies and municipalities, are eligible to apply for the grants. The funds may be used for school resource and police officers, safety equipment, and programs/trainings. More information is available at: http://www.education.pa.gov/K-12/Safe%20Schools/Pages/Safe-Schools-Targeted-Grants.aspx. 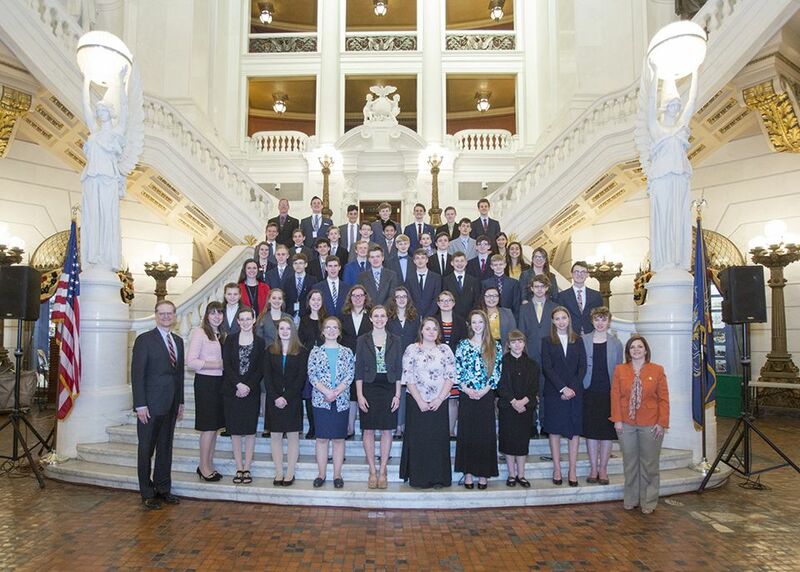 State Representative Donna Oberlander and I welcomed the young adults from the TeenPact Leadership School when they visited the state Capitol on April 30. With the approach of warmer temperatures and the motorcycle riding season in Pennsylvania, PENNDOT is offering free motorcycle training courses. These courses for novice through seasoned riders are offered at numerous locations statewide to Pennsylvania residents who have a motorcycle learner’s permit or motorcycle license. All training courses are conducted on a riding range, under the supervision of certified instructors. Motorcycle learner’s permit holders who successfully complete the course will be issued a motorcycle license. For more information or to enroll in a course, visit www.pamsp.com or call toll-free (800) 845-9533. Motorcycle crashes decreased from 3,450 in 2016 to 3,187 in 2017, resulting in a corresponding drop in fatalities – from 191 in 2016 to 185 in 2017. There were nearly 378,000 registered motorcycles and nearly 846,000 licensed motorcyclists in Pennsylvania in 2017. The Sunday of Memorial Day weekend – May 27 – marks the first of two free fishing days in the Pennsylvania. The second is Independence Day – Wednesday, July 4. Fish-for-Free Days allow anyone – residents and non-residents – to legally fish in Pennsylvania without a fishing license. All other fishing regulations apply. To make the fishing experience more convenient on the Fish-for-Free days, people can borrow equipment from dozens of fishing tackle loaner sites across the state. Many of the sites are right at state parks, which are always a popular place for visitors on the Memorial Day weekend. Loaner sites are also available at county parks and some public libraries. Click here for the list of loaner sites. More information is available on the Pennsylvania Fish & Boat Commission website, which includes interactive maps, regional fishing reports, and tips on fishing fundamentals. Fishing licenses can be purchased online at www.GoneFishingPa.com. Veterans and their dependents should be aware that there is no charge to apply for the benefits they have earned. The Pennsylvania Department of Military and Veterans Affairs (DMVA) is advising veterans that federal and state law makes provisions for accredited veterans service officers (VSO) to provide free advice and assistance to veterans when they apply for veterans’ benefits. VSOs are trained and accredited by the Veterans Administration (VA) to assist veterans, their dependents and survivors by filing disability claims, obtaining military records and accessing programs and services including: healthcare assistance, education benefits, burial benefits, and housing. There are approximately 200 VSOs in Pennsylvania. Veterans can also contact their county director of veterans’ affairs or for more information on VSOs. They can also visit the DMVA online at www.dmva.pa.gov and click on Veterans Affairs.